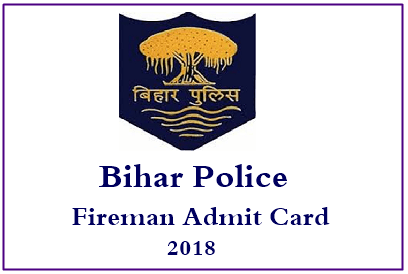 Bihar Police Fireman Exam Call Letter 2018: Central Selection Board of Constable (CSBC), Bihar is going to release the Bihar Police Constable admit card from November 1st on its official portal, csbc.bih.nic.in. all the applicants can get their admit cards before the examination. The admit card/hall ticket is the most essential document to continue with the examination. The CSBC is going to conduct the examination in many examination centers across the Bihar state. Aspirants can check the details of their examination center by downloading the admit card/hall ticket. The hall ticket verification will be done by the examination officers before attempting the test. Hence, the competitors must get ready by downloading the hall tickets before going to the examination. Hopefuls can check more details about Bihar Police Constable Fireman admit card from the following. The Bihar Police is the law enforcement agency for the state of Bihar in India. Bihar Police comes under direct control of Department of Home Affairs, Government of Bihar. The Bihar Police is headed by a Director General of Police. Central Selection Board of Constable (CSBC), Bihar releases the notification whenever there are vacancies in various departments. This year it has released the notification for the recruitment of constable & Fireman posts. Overall 1965 Police Constable, Fireman vacancies announced by the department. Many of the hopefuls seeking to get Bihar Police Constable/Fireman posts have applied during 28th May to 30th June. The screening of suitable candidates will be done through various rounds of selection process such as written test, physical eligibility test, physical measurements test, and interview rounds. Candidates who qualify all the rounds of the selection process will finally get the job in Bihar Police department. CSBC is Releasedthe Bihar Police Fireman admit card on November 1st. Aspirants can keep visiting the CSBC official website to download Bihar Police constable /fireman admit card. The organization will announce the admit card/hall ticket/ call letter release date before it releases the hall ticket.